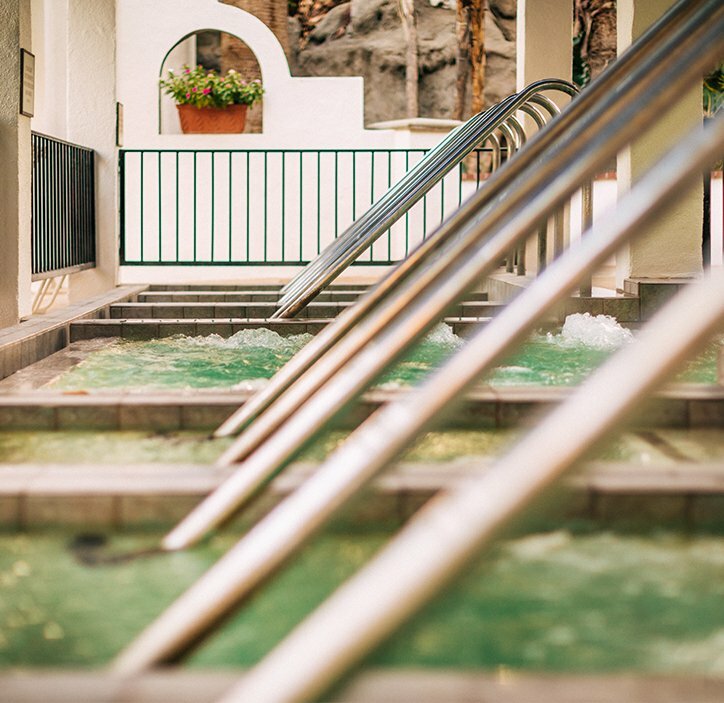 Spend 15 minutes soaking in these 104 degree, geothermal waters. These sulfur-rich springs ease joint pain and soften the skin. 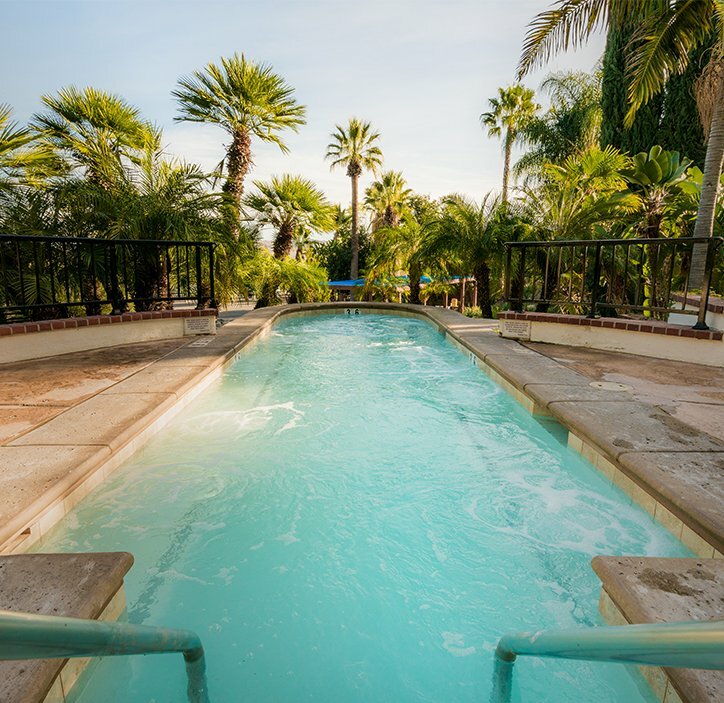 The sulfur-rich odor coming from these pools is a necessary and natural exchange for the powerful healing effect these waters have on both the body and soul. 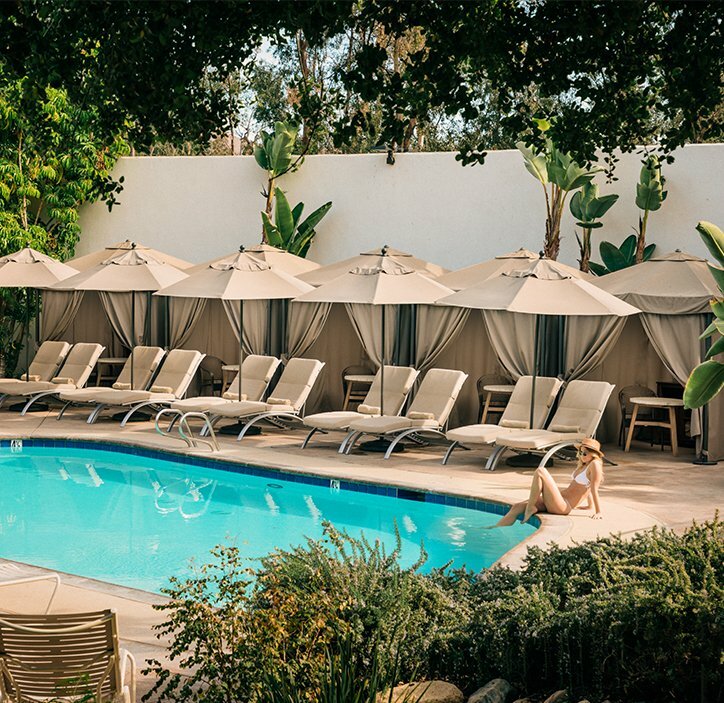 Relax, recline and reconnect with friends in our shallow Lounge Pool. Grab a pool float and while away the day. It’s the perfect place for lounging, sipping and people watching. 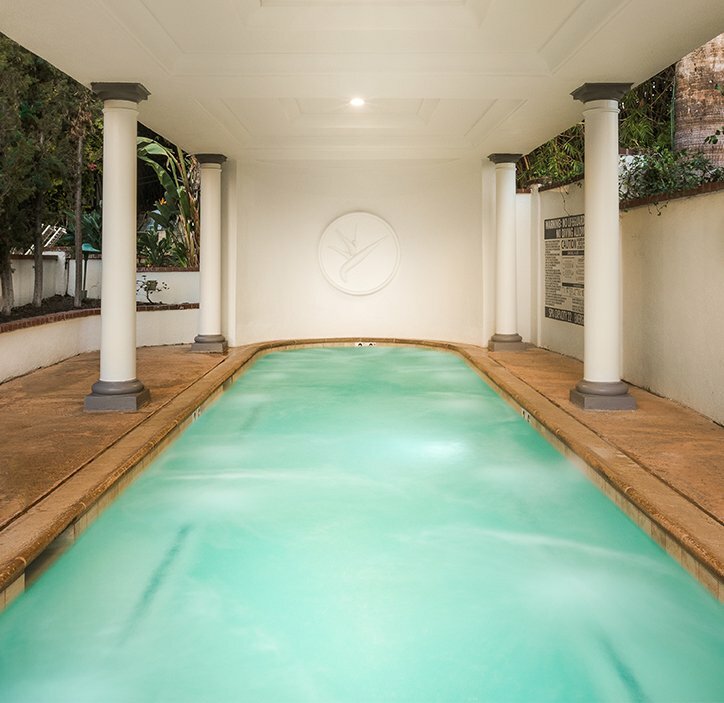 Salt water is very relaxing for our nervous system, so we fill this pool with Epsom salts that are rich in magnesium and sulfates, both of which have a therapeutic effect on easing tight muscles and joints and cramps and inflammation in the body. This hydrotherapy experience is guaranteed to kickstart your circulation. Blood vessels open up in the hot water (101.5F – 102.5 degrees) and constrict when you plunge into the cold water pool (55F – 65 degrees). There is nothing like it for a blast of energy, while boosting blood flow and flushing out toxins at the same time. We dare you to take the plunge! This is our exercise pool. Here you’ll find Aquafit and Aqua Zumba classes, or just jump in any time you feel like a swim. Stimulate your immune system with the sulfur, calcium, magnesium, sodium and potassium content in this mineral water pool. 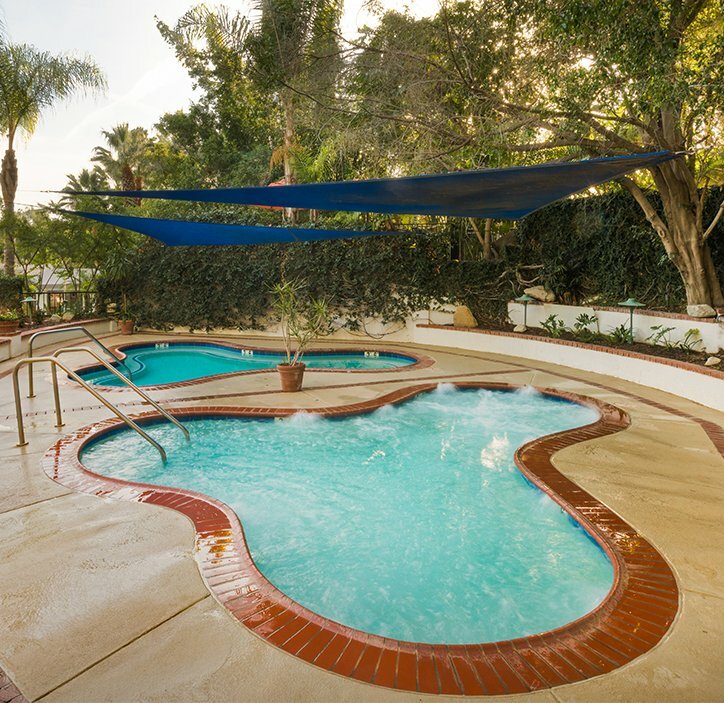 Enjoy long views of the Santa Ana mountains from this beautiful pool, where you can watch the sunset with friends, and a cocktail in your hand! This scenic spot also reminds us of the power of nature for our sense of well-being. This pair of pools on the north side of the resort is bathed all day in full sunlight. Relax in our floating hammocks in this lively area of the resort or find a shady spot in the two-person poolside cabanas, which you can book here. Found in our Bath House changing rooms, these indoor pools of classical proportions are bordered by stone colonnades, classical arches and mosaics, all designed to bring out the god or goddess in you. We believe in keeping our dishes fresh, clean and Californian. Our farm-to-table philosophy means that we source organic and locally grown ingredients whenever possible. We have two restaurants on property as well as a juice bar and our new cosmopolitan bar, The Lounge 1860.